Photographer reflected, originally uploaded by Zardoz67. Just a very short blog post for today so apologies in advance. Not a great picture either if truth be told but there is a very good reason, honestly. On Saturday, I delivered 15 framed prints of my images to the offices of DidsburyLife, which is on Burton Road in West Didsbury and spent most of the afternoon hanging them (with a little help from Helen and Pete from Didsbury Life). This all came about following a chance encounter on Twitter; to cut along story short, a tweet by a friend of mine regarding this blog was picked up on by Helen who liked what she read and saw. After a short e-mail dialogue I went in to see them and was amazed when they offered me some hanging space on their office walls. So, in effect, I now have myself an exhibition. True it’s small (15 pictures in total) and imperfectly formed but an exhibition nonetheless. The pictures look really good framed and on the wall and I’m really pleased with them. Even if this exhibition achieves nothing in terms of generating a picture sale or making my work widely known (i.e outside of Chester) it is still something that I am immensely prouf of and that I still find difficult to believe compared to where I was this time last year, a time when this blog was not even a half-formed idea. 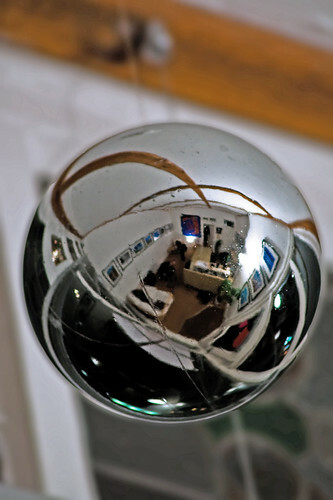 I wanted to blog about this event but did not want a photograph that showed pictures of pictures on walls; the idea of this image was to utilise a silver ball hanging from the DidsburyLife office ceiling and use it to reflect the exhibition and myself. The fact that the pictures on the wall were taken by me and liked by other people is a fact that is difficult to fathom, espcially as I am less than 2 months into the ‘year of positive thinking’. I am regarding this as a happy accident, that serendipity word again, and am content to just go with the flow. I have friends and contacts on Flickr that I consider to be be better photographers than I am and I’m still not sure how this has come about. I can only conclude that all this proves is that a) maybe I’m a better photogrpaher than I think b) Twitter is a great marketing tool and c) writing this blog was the best decision I have made since picking up the camera. For this I owe a debt of gratitude to Stewart Randall, the pro photographer that showed me how to use the camera properly and suggested that I document progress in a blog; to all the friends and family that have supported and built my confidence on the way; and to all the people from the blogosphere and world wide web that have taken the time to comment on the photos that I post. Tonight, I am undertaking my first comissioned shoot for a restaurant in West Disdbury; yesterday, against my better judgement, I got some really good images at the RAF museum in Cosford (good if you like planes that is) thanks to my son’s obsession with all things military. Photography is taking my life in some interesting new directions. Thanks, everyone and depending how tonight goes things could get interesting. This entry was posted on Monday, February 22nd, 2010 at 3:24 pm	and tagged with depth of field, Digital, Photography, reflection and posted in News, Photography, Still life. You can follow any responses to this entry through the RSS 2.0 feed. Love the fact that our little £1.49 silver Xmas decoration [which, if truth be told, I forgot to take down! ], is now part of the history of your first exhibition! It’s onwards & upwards from here Mr Nelson! Hi Mark, many congratulations. I regularly follow your blog and have enjoyed watching your photographic skills develop. Your images are fantastic and you deserve every success. Wow! Congratulations on the exhibition! I’ve been checking on your blog, but kept getting ‘mud glorious mud’… so left it for a while… all the while wondering where you were… And Wow! THERE you are, hanging 15 prints and heading off to do commissioned work. Good for you!